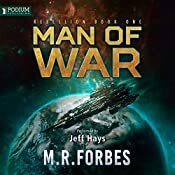 Great listen this week, with author M.R Forbes and narrator Jeff Hays. It has been an interesting week. But at least I had one great book on the cards. As soon as it was live, I wanted to listen. So I finished the audio I had on the cards and dived right in. I wasn’t disappointed. By the author or the narrator. Which to me says a lot. Review as follows —– with some spoilers sorry…. I think when you start to listen to AudioBooks in the way I have, you do become fans of people. Jeff’s books were some of the first I had the pleasure of listening to, even within a genre I wasn’t a lover of, and I am a fan of his. Add in the sci fi element and well I’m sold before I even know the premise. 🙂 Some things you know are just going to be a good listen. The fact that a story can be written so many ways just excites me. You might say that I’m biased, but no I’m not. I love a good story and these are my reasons for enjoying this audiobook and yes, it does include some spoilers. – ——- —– apologies for the spelling of names… and in no real order, just as I remember my fav bits. I think one of the best decisions that M.R made was to keep the POV’s to two really amazing characters. You have Donovan, and Gabriel. Both very strong men, and totally different in their upbringing and beliefs. I liked that a lot. And saying that… the writing entwined these both so vastly different worlds perfectly. The supporting characters. For Gabriel he had Miranda, Daphnia and her husband Soon. The of course the old gater, his father General St Martin. Who I must admit I never expected to make a come back. When he went to his room on Major Choi’s hint/order. I was so surprised but in a nice way. I must admit that I do think the start is a little slow, but I believe the characters saved it there. I wanted to know more about them and why they thought and acted as they did. The ‘science’ in here is a little over exaggerated, and for someone like me who isn’t that much in the know over it, it might well prove to be a very entertaining story. But, I did have to knock it down a peg for some of the things that didn’t quite add up in my head. Still it was one of the better books I’ve listened to so far. So yes, character wise, I really enjoyed the interaction between Donovan and Diaz, I knew she had a crush on him even before he mentioned it, because it was defo going that way. Though I’m still very glad that they stuck to military protocol and didn’t do anything, even if she kissed him towards the end. It was just a step over the line that I could live with despite the circumstances. Gabriel I think went through the most in my mind being the pilot who lost everything in the woman he loved to just existing to evade the Dread, and to do his missions. The last one almost cost him his life, but was also the downside to the decisions on the colony he was settled in. If it wasn’t for Major Choi and a few others, Sturges.. I think he would have stayed in his hole and never come out to rescue the scientist, and to then go about and take the Majellen with his father. Which of course I’m glad he did. I do think that Donovan and Diaz in the Dread mothership seems a little weird at first. Too good to be true… thought they were both gonners. but I was so glad they got out okay with the help of another.. a clone, and a clone no doubt of Gabriel’s mother… It’s like you can see all the pieces the author wants you to put together, and you come up with 10 instead of 12, but the fact is you’re kept guessing and wanting and needing more. I do think that the ending leaves us with a lot of questions and a lot of them might never be answered for a while, but I think they’re really good ones. This is the kind of book I would listen to, wait for the second and then listen to this again before I dived back in for more. This is to me because there were hidden depths to all the characters and some i might have guessed wrong and others I know I guessed right. Because they did things as I expected. Overall this is an epic start to something much bigger, and of course there will be parts some don’t like and others love. All in, this was a great book, well written, voiced and delivered by Jeff… I couldn’t ask for more in the genre. And I totally look forward to more..